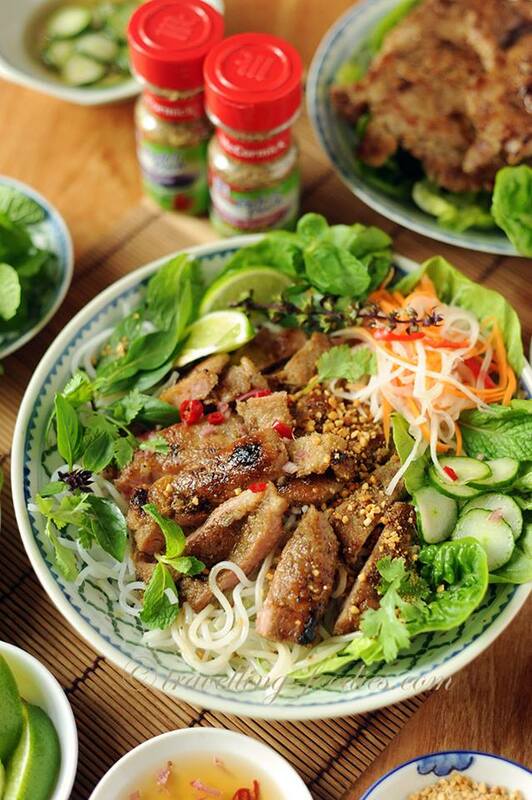 Apart from Pho Bo, my next to-go-to Vietnamese dish to order whenever I am dining in a local viet deli would be Thit Heo Nuong Xa Vietnamese Grilled Lemongrass Pork Chops with Rice Noodles. Love the smokey and lightly charred aromas of the grilled pork chops against the assortment of crunchy and refreshing greens. The use of McCormick's Perfect Pinch Garlic Pepper Salt Free Seasoning and Perfect Pinch Vegetable Seasoning not only helped to save time but also to build more flavours into the lemongrass pork chops! Lots of salad condiments both fresh and pickled to enjoy with the grilled pork chops making the dish perpetually guilt-free!#McCormickSG. In a small bowl, mix water and baking soda to dissolve. Mix well and set aside for 30 min in the fridge. Remove from fridge, rinse twice to remove baking soda solution. Pat dry, return to mixing bowl and set aside. Place all the marinade ingredients in a food blender and pulse to obtain a coarse paste. Pour the marinate paste over the pork chops and rub to coat evenly. Set aside to marinate for at least 30 min, preferably overnight in the fridge. To cook, grill the pork chops, either over a proper charcoal grill or in an oven until both sides are nicely browned and edges slightly charred. Set aside to rest and cool down until warm before cutting into broad slices. Place all the wet ingredients in a microwave proof bowl and microwave to just melt the sugar. Add minced garlic and sliced chili. Set aside for later use. To assemble, place lettuce leaves over a serving plate. Place basil, mint, coriander leaves, red chilies as well as pickled white radish and carrot strips sporadically around the plate. 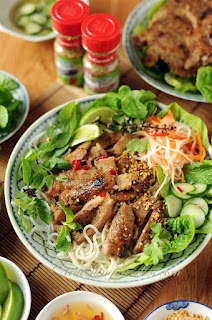 Drizzle Nuoc Cham Dip Sauce generously over the ingredients and sprinkle with a tbsp of crushed peanuts. Garnish with a quarter of green lime at the side and serve. To enjoy, squeeze the lime juice over the pork chops and give everything a good toss before eating. Bon appetit!